Critical care nursing in Europe varies from one country to another . 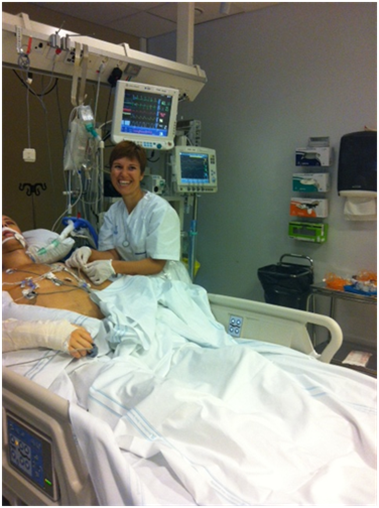 The EfCCNa Exchange Programme enables critical care nurses to spend some time on a ICU in another European country. All critical care nurses or nurses working in intensive care who's national professional organisation is member of EfCCNa. Since its implementation more than 40 European nurses have participated in the programme so far. Here are quotes from our last delegates. I heard about the possibility to participate the EfCCNa Exchange programme from my friend and colleague Kasia Jacobsson. I am working in Helsinki, Meilahti Hospital Intensive Care Unit M1. I got interested about the exchange progreamme right away and Kaisa recommended Croatia for me. I hav never been in Croatia before so I got excited about it. I also wanted to see and get to know about a different kind of culture. We started to plan my trip to Croatia in Autumn 2017. Jelena Slijepcevic kindly offered to host me. I spend an unforgettable weeek with Jelena in the University Hospital Centre Zagreb, Department of Aaesthesiology, Reanimatology and Intensive Care from 22 -29 September 2019. The neurosurgery ICU has ten beds. Nurses do two shifts, day shift lasts from 7am to 7pm and night shift from 7pm to 7am. There are usually six nurses working in one shift. The biggest difference compared to Finland is that the nurse - to – patient ratio in my unit is 1:1 and in Croatia it’s 1:2. In Croatia they don’t have chairs to sit at the patient site for nurses and they write patient data on paper. They also have great views from window to mountains, at the moment in my unit we don’t have windows because the construction of the new hospital is in progress. I noticed that co-operation between nurses and doctors was very uncomplicated and everyone appreciated eachother’s knowledge. People there in Croatia are extremely friendly. In Croatia patients were treated really well and professional (as we do in Finland, too). One big difference was that patients didn’t have any decubitus in Croatia. Nurses did everything by themselves and they didn’t have any assistants to help them. I also had a chance to visit in cardiac surgery ICU, general surgical ICU and operation room. It was really interesting to see different nursing culture. The most important thing I learned in my exchange week was that even we nurses have busy work shifts and resources are limited, it’s important to be positive and enjoy. Thank you to Kaisa and Adriano who made this possible and special thanks to lovely Jelena who organized unforgettable and super week for me in Zagreb. I also had chance to visit the beautiful Plitvice lakes area. I can recommend the EfCCNa Exchange Programme to every ICU nurse - sometimes it’s very healthy come out of the own comfort zone. About a year ago I heard EfCCNa Exchange Program. I chose Switzerland because they have high standard and excellent quality healthcare system. My colleague Kaisa Jacobsson helped me to find contact person from Lugano, canton of Ticino. Paul Van der Heiden kindly promised to accommodate me during my visit. I spend four days Cardio Centro Ticino with Paul. The biggest difference compared to Finland is that many hospitals in Switzerland are private. This effects to the whole culture in healthcare and of course how much people pay for insurance. In Finland health care is mainly public and at present there is becoming a reform of social and health services. This currently affecting nurses status and wage levels too. Cardio Centro Ticino is very appreciated private hospital and that made my visit interesting. The hospital has 45 beds, and it is specialized in cardiac surgery, cardiologic and intensive care. On the Tuesday 10th April I was warmly admitted to the ICU in Cardio Centro. There were 9 beds and one nurse per one or someday two patients at the daytime. At the night nurse/patient ratio was 1:2. Patients had different kinds of cardiac illnesses and the nurses had excellent professional skills to take care of them. During the days I was part of the team and the patient I was looking after, spoke English, too. It made my exchange rewarding. In the free time, Paul taught me many things about IABP, ECMO, EKG, CVP, blood gas analysis etc. It was so inspiring and I learned so much new. The nursing practices were of a high quality and the nurses made for example haemodialysis and ECMO. They also took care of respiratory therapy and hemodynamic monitoring. I paid attention to the low hierarchy and good working atmosphere. Nurses and doctors worked together seamlessly and the patients were well cared and satisfied. I also got the impression that the nurses were very motivated. Many nurses had come from Italy, which meant multicultural competence in the workplace. I found some differences in treatment practices. Here few examples. Pain management is one thing, patients were painless, there used much more opioids than in Finland. Of course patients had also various ailments. There were no nurse chair at the patient sites. Patient data were recorded on paper by pen, not in computer like in Finland. It still worked well. Nurses didn`t leave the ward during their turn. And the lunch breaks were scheduled, what was a really good system. Head nurse worked with also with the patients and was the nurse-in-charge, too. The department`s activities were well organized. 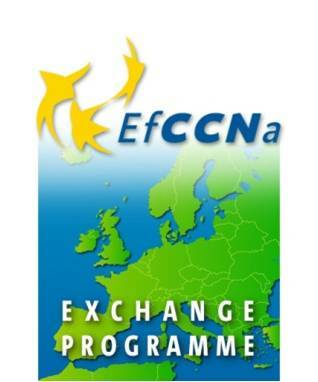 In summary, the EfCCNa exchange program opens up prospects for European Critical Care Nurses. I had a wonderful trip in Lugano and I recommend this program everyone who wants to expand multicultural nursing experiences. Special thanks to Paul and his family, Kaisa, Adriano and all my lovely colleagues who made this possible! 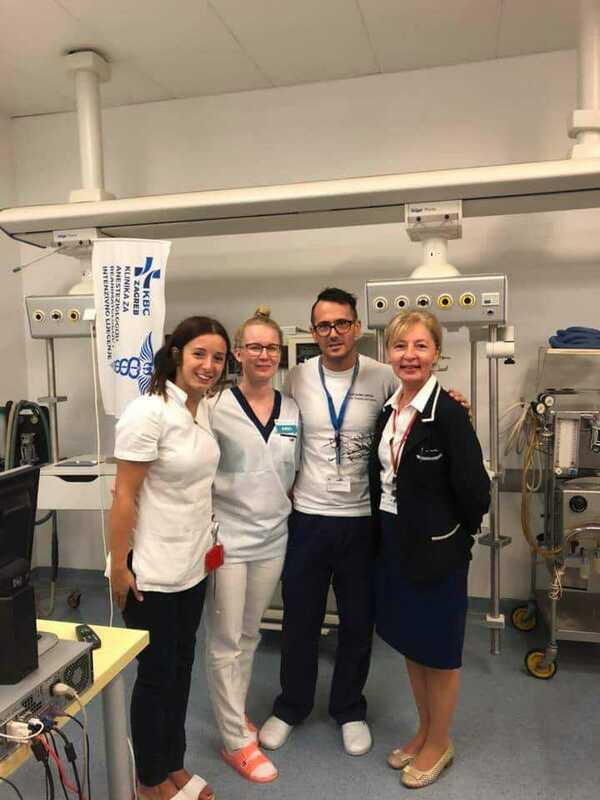 After meeting qualified specialists from Norway at the EfCCNa congress in Belfast in February 2017 the possibility occurred to use the exchange program of EfCCNa to think outside the box – how do critical care nurses work in Norway? What are the differences to Germany? The most important structural differences to Germany are the framework conditions for the Norwegian nurses with regard to the numbers of employees present at one shift. 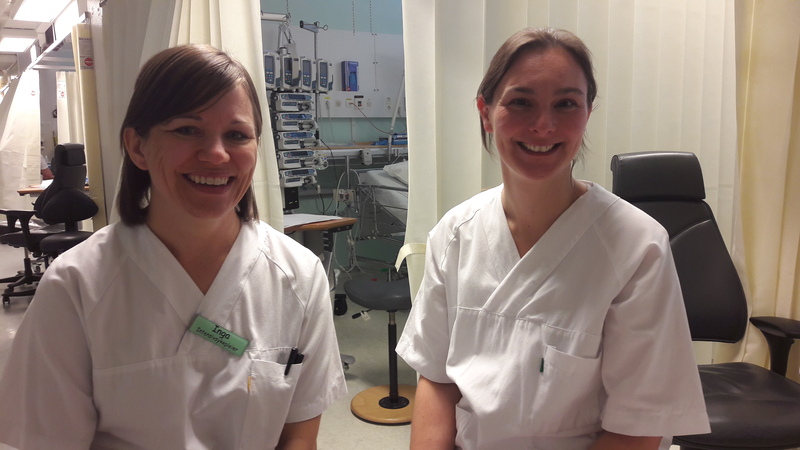 Because the intensive best care practise for the patient is the primary focus in Norway, there is a minimum of a one-to-one-ratio in care done by critical care nurses in every of the three shifts. For every four patients, there is additionally another qualified personnel nurse to support the critical care nurses at the bedside. Apart from that each shift has always one shift supervisor who is responsible for organisational tasks. As a result the intensive care patient is in every scope of his treatment safeguarded. Best practice, continuity in care, high awareness of hygiene for a sanitary working environment, infection prevention, a faster achievement of the therapy goals especially the weaning can be designed to be more targeted and focused through intensive care. 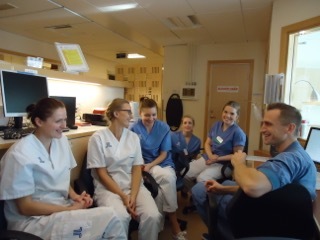 The critical care nurses use a more efficient, multi-disciplinary way of communication and relatives are also included in certain duties of this patient-centred care approach in Norway every day. Because of these conditions the individual care for every patient with the current applied nursing and medical standards are ensured. The most important principle is that the patient will be never left alone by a nurse. Are there medical tasks to fulfil like drawing up the syringe in a special pharmaceutical room or the responsible critical care nurse has to take the mandatory break there will always be a critical care nurse present with the patient. During my work shadowing I have enjoyed to be a part of this top quality and respectful way of working at the intensive care unit in Tromsø. Thank you very much to all of my colleagues at the Universitetssykehuset Nord-Norge for the impressive days and the open admission to your team. To sum up, this was a really enriching experience, and that's why I encourage other colleagues to join the programme. It is the way to experience first hand that nursing care is not the only thing that makes a difference; it is also factors such as the organizational structure and inter-professional communication. Each team, in their context, has their strengths, threats, opportunities and weaknesses. Nowadays, in Spain, we are in a context of economic difficulties that undoubtedly would influence health outcomes, but we have a great innovation, creative potential and motivation to improve the processes of care to our patients. The EfCCNa exchange programme is another opportunity to expand horizons. intensive care in Europe. We had the opportunity to gain new experience and comparison of our knowledge and skills to the knowledge and skills of our Swedish colleagues. The level of nursing care in Sweden is high - Swedish nurses have the capacity and conditions to ensure that the patient be able to comprehensively cultivate. to the patient with the appropriate amount of staff among others in the prevention of infections, for the safety of patients and their welfare and safety of personnel. In Sweden, this consciousness exists. 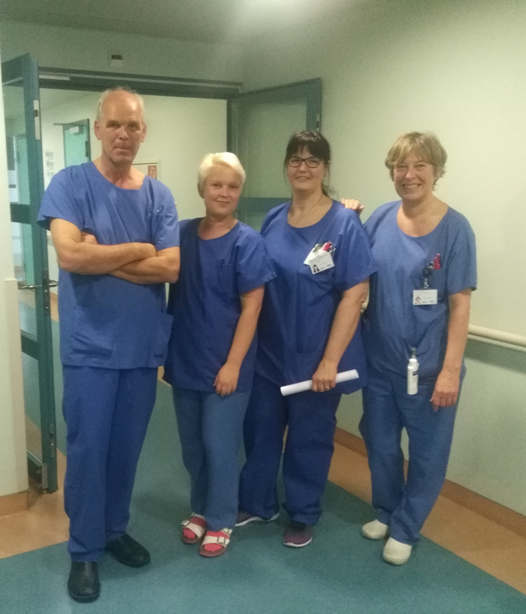 In addition, we had the opportunity to meet many wonderful people who served us help and tried to do everything that we benefited as much as possible during our stay in Karolinska Hospital and Danderyd Hospital.